"Better a drop of the extraordinary than an ocean of the ordinary." 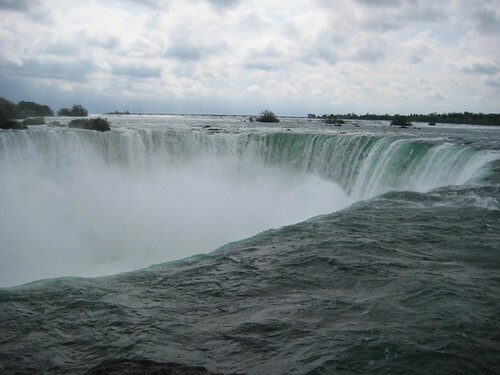 I’ll let you in on a little secret: I’ve lived in Toronto since 1997 and I’ve never seen Niagara Falls. One of the natural wonders of the world ninety minutes away and I’d never gone to see it. I’d also never visited the Niagara wine country, but that’s a little less shocking since it was only a few years ago I began to care that there was a wine region nearby. So, we thought we’d cure both ills at once. We took the day off, rented a car and set sail. The weather wasn’t bad when we left Toronto, passing Mississauga and Oakville (first time past highway 403 woo!) and crossing the lovely skyway bridge to…to…oh my GOD Hamilton is ugly. Ugh. I closed my eyes until we reached Beamsville. We stopped there as I had it on good authority that there are three fantastic wineries there, practically next door to each other: Fielding, Hidden Bench and Thirty Bench. As we walked into Fielding (whose tagline constitutes the subject of this blog post, by the way) Nellie said that it felt to her like going to church. We’ve never tried a Fielding wine we didn’t love, and their building is rather like a cathedral. The staff was awfully nice, very helpful and fairly convincing: we tasted nine wines, and left with bottles of the Lot 17 Riesling, Sauvignon Blanc, Meritage, and White Conception. Hidden Bench, just around the corner, was different: smaller, quieter, more intimate. The lady working the tasting counter took a chunk out of her day to talk all the about the wines, the history of the winery and the vines. Their wine tasted so clean that we ended buying three bottles: a Fume Blanc (which Nellie realized later we’d drunk before) and two bottles of their Terroir Caché Meritage. We’ll drink one soon, and stash one for a few years. We loved Thirty Bench for two reasons: the clever tasting notes (see above) and the more structured tasting. We’d enjoyed the benefits of near-empty tasting rooms at all three spots, but at 30 Bench they brought us to the comfy tasting bar and threw seven (!) samples at us. We settled on their Cabernet Franc and Cabernet Sauvignon, and left startled that we’d so far collected more red than white. The lady at Hidden Bench had recommended a spot called August for lunch, and when a local with good taste recommends a spot for lunch, you go. We weren’t disappointed; my pasta with andouille sausage in a pesto sauce was very good, as was Nellie’s salad. Happily she was able to get a glass of Daniel Lenko white Cabernet to go with it, and I had a glass of Creekside Pinot Grigio. All was right with the world. On we drove (don’t worry, I was sipping and spitting, not drinking) to Niagara on the Lake. We checked in to the one hotel I could find in NotL that didn’t fit the dictionary definition of “frou-frou”: The Shaw Club. Beautiful hotel, beautiful room, just top-notch all around. Highly recommended if you’re staying in that town. That town, by the way, is a little too precious…a walk up and down the main strip was like one long gift shop. On the stroll back to the hotel we decided to stop in at the Olde Angel Inn and get at least a bit of the local quaffing culture. Despite my tasty Amsterdam Two-Fisted stout, I was miserable as a headache was hitting me with both barrels. We went back to the room to relax before dinner. Dinner was at Stone Road Grille, the de facto NotL dining champion according to Chowhound. The joint was packed when we arrived and, despite the fact that we’d made reservations a month ago, we had to wait half an hour for a table. My mood might have been soured had the host not been a bizarre combination of charming and unhinged…if I didn’t know better I’d swear he was from Newfoundland. Anyway, the meals. In a word: superb. I started with — and I’m quoting from the menu here — the scallops wrapped in smoked duck breast bacon, sweet onion puree, mache salad, icewine salmis vinaigrette, paired with…well, with the giant glass of Fielding Pinot Gris the host had poured me while we waited. Nellie had a truffle and asparagus risotto paired with a 13th street sparkling white. Nellie declared it the best risotto she’d ever tasted. As for me, I don’t even really like scallops and I loved this. My main was the Charlie Baker fried chicken with buttermilk potato puree, braised leeks, sauteed greens and bubbly sauce, while Nellie had the grilled flat iron steak frites with sauce béarnaise and garlicky beans. We sought out a wine that would work with both (!) and settled on a 2007 Southbrook “Whimsy” Cabernet Franc. And wow, did it work. We were still enjoying it when our strawberry & rhubarb clafouti arrived. Perhaps the oddest part of the night was when we asked for a cab. Despite being warned by T-Bone about the scarcity of cabs in the city, we were hopeful…and we were to be disappointed. The nearest one was 30-40 minutes away. So, much to our amazement, the semi-crazy host pulled around in a giant purple minivan and offered to drive us home. Weird, but pretty cool too. More than made up for the long wait for a table, and also made for a great laugh the next morning. Day two started with an excellent breakfast at the Shaw Club’s restaurant before checking out and driving south to see Niagara Falls itself. Never mind the schlocky shops on the way into town, the outrageous cost of parking, the mind-numbing tackiness of the gift shops you’re forced through to gain a vantage point…the falls are amazing. I could probably stand at the river’s edge all day and watch the water plunge over, but not today…it was freezing, and spitting rain. We stayed long enough for me to really soak it in, get some pictures and get even wetter from the spray, and then walked back to the car. A sudden storm burst just long enough to soak us as we ran to the car. It wouldn’t be the last time. We did have a break in the rain long enough to visit Ravine Vineyards, another recommendation. Their tasting room wasn’t quite open yet so we had some tasty treats at their bakery first. Once the sun was over the yardarm we picked up a bottle each of their 2006 Cabernet Franc and their Redcoat blend, and got some recommendations from their staff about the next stop on our tour. Southbrook‘s beautiful LEED-certified building suits their organic and biodynamic wine. We’d already decided to pick up a bottle of the Whimsy, since we’d loved it the night before, and while we expected to walk out with their rosé, we instead left with a bottle of their “Fresh” white blend, which won us both over during the tasting. As we’d pulled into Southbrook the weather had turned vile. Rather than visit one more we decided to take nature’s hint and just hit the road. When the rain comes in sideways, it’s time to go home. It was tough going just outside of Niagara on the Lake because of the driving rain, and then on the Skyway as we passed Hamilton the wind actually blew our car halfway into the next lane. All the dreary, windy driving made us both sluggish, so we dropped the wine, dropped the car, helped an Australian man figure out how to adjust the seat in his rental and happily deposited ourselves on our couch and admired our new wine collection. 13 bottles of wine, 3 great meals and a wonder of the world…not bad for 28 hours. Thanks for visiting the Bench. Glad you enjoyed Hidden Bench. Next time I’d love to say ‘hi’ when you come for a visit. Glad you had a good time, we are thinking of doing a trip back to the wine region this summer. Dude, I was sick as balls that weekend. I’d have gladly joined you if I’d been able to breathe through my face.